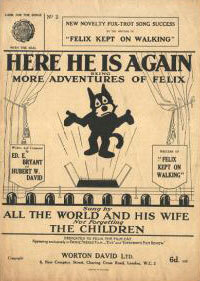 Felix the Cat first hit the screen on November 9, 1919, in Feline Follies. 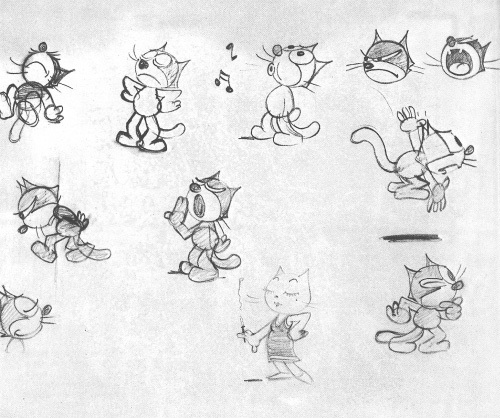 The mischievous felinecreated by Otto Messmer for the Pat Sullivan studiorocketed to fame, holding a spot as the world's most popular cartoon character until the advent of Mickey Mouse. The wild, witty cartoons made during this period included such classics as Felix in Hollywood (1923), Felix Switches Witches (1927), and Comicalamities (1928). They were released by Paramount Pictures (1919-21), M. J. Winkler (1922-25), Educational Pictures (1925-28), First National (1928-29), and Copley Pictures (1929-31). When Felix's screen career faded in the 1930s, the cat spent a few decades in a memorable series of comic books and strips. This was the era when Messmer's assistant Joe Oriolo rose to the forefront, later to produce the 1958 TV series about Felix's Magic Bag of Tricks. Another TV series, Film Roman's Twisted Tales of Felix the Cat, came about in the mid-1990s. Since that time, Oriolo's son Don has produced Baby Felix for the Japanese market and Felix the Cat Saves Christmas, a direct-to-video special. While there are many Felix sources on the Net, this site focuses in particular on Messmer's version of the character. You'll find historic images from renowned reference books, from international archives, and from fans' contributions. I'm also featuring filmographies, videographies and other information sources, partly derived from my own research and partly compiled by Cole Johnson, Timothy and Colin Cowles, and the late Denis Gifford. Special thanks also go to Pietro Shakarian, a cartoon researcher who's now helping me maintain this site. The cinema was where the world first met Felix the Cat. Bored by one-dimensional silent stars, folk were electrified by this wily, most communicative felineat once a cat who walked by himself, a party animal in search of sustenance, and a curious kitten game to help others in need. It was a feat merely to combine these disparate elements into one personality. Otto Messmer did it year in, year out. The Classic Felix Filmography Here's the most complete Web listing of 1919-1936 Felix shorts that I know to exist. Starting with the published filmographies of John Canemaker and Denis Gifford, I added the research of Dave Butler, Colin and Timothy Cowles, Cole Johnson, Mark Kausler, Ron Magliozzi, Joy McIntire, Pietro Shakarian, Tom Stathes and myself. You'll find story synopses, video and DVD sources for many films along with the original booking dates. 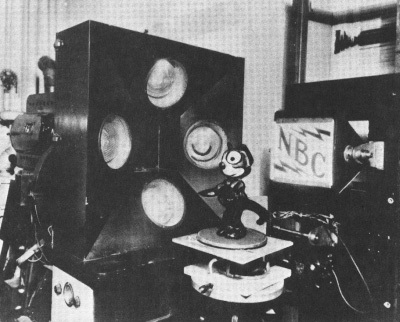 The Pre-Felix Pat Sullivan Studio Filmography Check out rare data on cartoons produced by Messmer and Pat Sullivan long before Felix's debut. You'll find story synopses, credit listings as given and original booking dates for many of the shorts. The Felix Film Stills Archive My web co-conspirator Pietro Shakarian presents select stills from various shorts in the filmography. Check out classic art from classic films like Felix Revolts (1923), Tee Time (1930), and more. The Classic Felix Encyclopedia This downloadable Word file supplements the Classic Filmography with extensive data on home movie releases and present-day archival holdings. A "living" document, it is constantly expanding to incorporate the latest knowledge on exactly which films exist and where collectors can find them. Thanks in particular to Colin and Timothy Cowles for contributing their invaluable research. 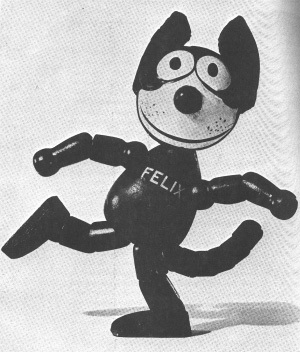 The TV Felix Filmography chronicles Joe Oriolo's 1958 Felix TV series and Film Roman's 1995 Twisted Tales of Felix the Cat. Video and DVD information is included where available. Full-length public domain cartoon: Felix Woos Whoopee (1930) Felix has one drink too many out on the town, then hallucinates and begins to see wild and surreal creatures. He finally escapes for home... where an irate Kitty is waiting for her better half! What would become America's Felix Sunday newspaper comic strip debuted in England's Daily Sketch on August 1, 1923. The series ran weekly for twelve episodes, all of them pencilled and inked by Otto Messmer. Starting Sunday, August 19, 1923, King Features syndicated the twelve Sketch strips in the United Statesreinked, for whatever reason, by studio boss Pat Sullivan. They were also published in a different order: the first strip syndicated in the USA had been the third strip in the UK series. The saga doesn't stop there. The only Stateside paper to run Felix from the start was the Boston American, which published Sunday strips five days late. So while King syndicated Felix's debut on August 19, Felix didn't actually appear in an American newspaper until Friday, August 24. By the end of the year things had calmed down. Sullivan's involvement was over; King followed up on the twelve Sketch strips with Sundays both penciled and inked by Messmer. And multiple papers were printing the Sunday strip properly by nowthat is to say, on Sunday. The Felix daily strip is believed to have begun in May 1927, though the exact start date has not been securely pinned down. Until mid-1931 the "artist" was Jack Bogleactually reinking Felix animation drawings to create comics panels and stories. In 1931 Messmer took the daily over from Bogle, at which time its art became all-original to the strip. November 28 to December 21, 1927 (pages 2 3 4 5 here) KFS daily strips, plot by Otto Messmer, pencils by Messmer and the Pat Sullivan studio staff, script and inks by Jack Bogle. Based on the cartoon Roameo (1927). Note: The December 15 strip is missing from our sequence; we'll gladly incorporate it if someone can loan us a copy. May 13-16, 1931 KFS daily strips, plot by Otto Messmer, pencils by Messmer and the Pat Sullivan studio staff, script and inks by Jack Bogle. Based on the cartoon The Non-Stop Fright (1927). When Felix soared to international stardom in the early 1920s, it was only natural that he become the subject of musical tributeboth sanctioned and not. Later, when sound and music came to cartoons, there were also recurring musical themes within the cartoons themselves. Felix Kept On Walking was the most popular song in London in 1923. See the words and sheet music. Download a MIDI file for the tune as composed, or this RealAudio file for a classic 1924 cover by Jack Hylton's orchestra (not part of this website; do forgive any download difficulty). Here He Is Again (Being More Adventures of Felix) was a followup by the Kept On Walking authorial team. See the words and sheet music. Download this RealAudio file for the tune as composed. Fido Followed Felix was also written in England in 1924. See the words and sheet music. Download this MIDI file for the tune as composed. 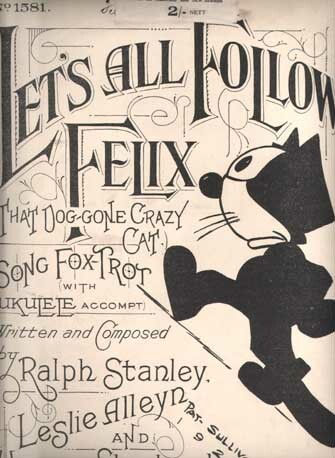 Let's All Follow Felix (That Dog-Gone Crazy Cat) is a sheet music tune we've never inspected first-hand. We have only this image of the front page. Drop us a line if you've got a complete copy and would like it featured here. Felix the Wonderful Cat was the 1958 theme song written for Joe Oriolo's TV series. You can hear it with this MP3 at www.FelixTheCat.com (as it's under copyright, I will not make a file available myself). Classic cartoons weren't released in a void. In the 1920s, Felix cartoons were accompanied by beautiful color posters and by black-and-white stills designed for cinema lobbies. Made available to the public in more recent years have been vintage animation drawings and sketches from the films themselves. Felix winks close-up in a classic pose from 1921. Felix fans today don't just want to see Felix in actionthey want to own tactile images and figures of the cat. T'was ever thus: in Felix's 1920s golden age, he was even hotter as a merchandising symbol, and some truly magnificent licensed items were designed. Jump to our new Felix merchandise gallery for an expansive look at some of these collectors' items! There's more classic Felix out there on the web. Take a look at some of our colleagues in the field. Dr. Jan's Cartoon Cat House is a wonderful source of Felix merchandise old and new. Felix: The Black and White Catalogue, by Classic Felix Page contributors Timothy and Colin Cowles, is an essential reference for Felix silent film collectors. Don't miss out; its importance cannot be overstated. Copyrighted characters referred to and shown are trademarks of their respective owners. Felix newspaper strips and other images shown are public domain material. Background design courtesy Mark Newgarden. All other text (c) 2007 David A. Gerstein, last updated 4 February 2007.